For almost a week now, I’ve run home from work in the afternoons. It’s about five kilometers. It takes me about thirty-five minutes. This is pretty slow, even for a big guy like myself. I’ll be happy if, in time, I can knock ten minutes off that time. The phrase, Little By Little, has been a revelation during these runs. Actually thinking it, mentally concentrating on it when things get tough (and when you’re not that fit, and it get’s tough five minutes in, you know it). "Little by Little". It keeps me going, so that even if I’m running not much faster than a walk, in my mind it’s still running. And it’s not stopping. Not walking. Although I do appreciate very much a good walk, I’m specifically drawing a line between the two. And it’ll get better, barring injury or some other big life change. My body should strengthen and gain endurance. I’ll never be fast, but I’ll get faster than I am now. What’s it all in aid of? Keeping fit. Feeling the burn (I love that good-sore muscle burn). And most of all, breathing life into my dreams of playing for the Wallabies. Ahem. Stats. Reports. Most people deal with stats in their daily lives. Even folk who never go near a computer. This system would take in feeds (you could kick off with just XML), and intelligently work out patterns based on the input. There would be four parts, that I can see. There are so many sub-systems you could build around this. Contextually refined for various tasks. But this one would be generic. Meant for the masses. I don’t regularly follow a lot of blogs. And I’ve dropped off most of the ones I used to follow, apart from a glance through my Netvibes every other while. Shamus Young started his blog (Twenty-Sided) to speak forth his Table-Top D&D experiences in 2005. Scouring through his blog (as I’ve done over the past couple of weeks) is fascinating. His writing seems to ring a bell/cord/something within me, so that I keep reading, post after post. One of the truly remarkable elements of Shamus’ blog is the way he puts the "reference your own posts" rule into practice. To see this, read a very recent post of his, Bioshock: DRM Forever. Notice the links back to previous posts on Twenty-Sided. Very cool. For me, a big appeal of Shamus’ blog is the aesthetic appeal. I really like the layout, the way colors are used. I”m no designer, but I know what I like. So Shamus, if you read this .. kudos! Please continue your excellent blogging. I look forward to many more of your provoking thoughts on gaming, amongst other things :). 5th or 6th grade I think. Our first boarder (a blind kid) had a knack for understanding otherworldly utilities like "Bulletin Boards" and wotnot. Dad’s XT and Green Screen transported us to a world of magic and swords and stats. Stats like you wouldn’t believe. At least, for a small-brained individual such as myself, who at that time thought Dungeons and Dragons was pretty much of the devil. Course, I didn’t actually know what D&D _was_. For us, this game was a boon. I played Bard’s Tale for what seems like an eternity in memory. The number of friday nights I told Mum I’d be in bed soon, "I’ve just got to map my way home". Mapping was such a big part of Bard’s Tale for me. Not just because I could use it as a map, but because it was an experience in itself. The graph paper, pencils, keeping them sharp, working out symbols for various in-game placements, encounters, and other stuff. Sometimes I miss this. It’s a left behind mechanism. And it wasn’t a sold mechanism anyway, more of a by-product. These days you have in-game maps and mini-maps and sometimes even note taking abilities within the game. But it doesn’t match up. There are some things that are far superior on the computer. I love have proper overhead maps and mini-maps for their purpose. But one day I’d like to make a game where people used exterior implements to fashion their own experiences of the world I’d created. What are your earliest RPG memories? 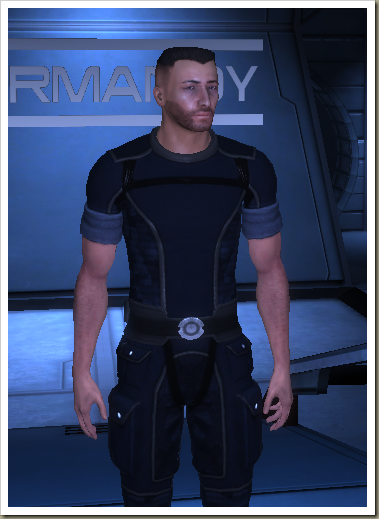 I’ve been playing a fair bit of Mass Effect lately, the PC Version. It’s good. The story is good, although I seem to like Planescape’s more. This might be because it’s a fantasy setting. It’s probably because Planescape has been the apple of my game-eye for so many years now. The shooter side of things is fun. I’m not a shooter fan so much. I don’t slide through those games with effortless ease. But it’s good. I like it. Still, something in me yearns for another Planescape, another Baldur’s, another Ultima (the good ones, you know who you are). Starting out, I had trouble using SLI. Big trouble. Like huge slow down. Switching it off gave me great frame rates. Of course, I had neglected to update my drivers since about November last year. Bad mojo. So with a flurry, the drivers were upgraded (thanks to LaptopVideo2Go) and we were away. Man alive! I mean .. Mass Effect! Awesome. I can play on full settings, and nary a slowdown to be seen (except for that treacherous Council place). It’s a lot of fun looking at things the way they were meant to be dreamt of (heh heh). Makes me not so eager to lash out for the 8800 upgrade that’s on the cards. Over the last few months I’ve managed to find some really cool blogs. Good gaming blogs mostly, but other stuff too. For a while now, in these blogs, Depths of Peril keeps getting kudos. So after a few hours playing the demo .. what can I say but BUY! This gives me an idea. What about a place you can go .. and the opinionated author gives you a "BUY" or "DO NOT GO NEAR" rating on games. I’ll probably have more thoughts on it soon. In fact, I’ll have more thoughts on other particles of life soon too no doubt. Need to get back into the Stu Talks.